Small business. 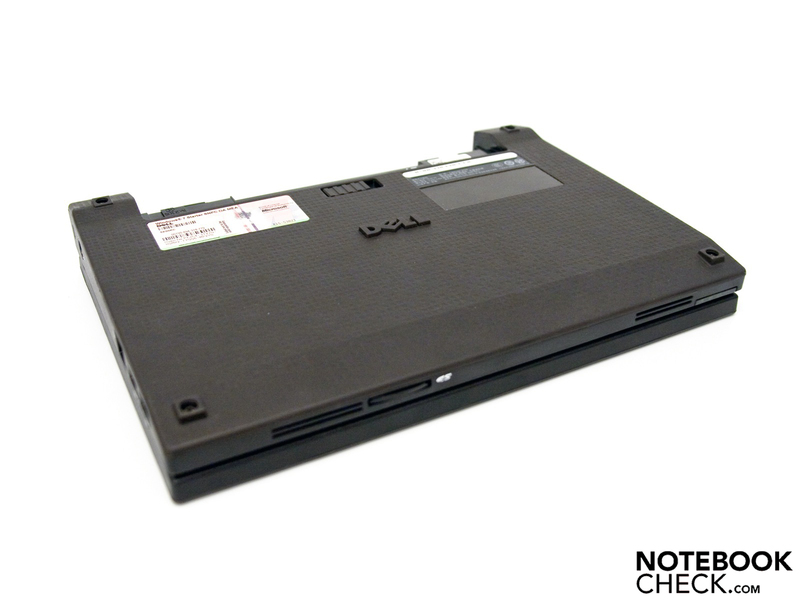 The smallest member of the Dell Latitude series has had a hardware upgrade while remaining in its old case. It is now equipped with an Intel Atom N470 processor, faster DDR2-6400 memory, a touchscreen with a higher resolution and a 3G module. The starting price for the new Dell Latitude 2110 netbook is currently €329 including tax (special offer) when buying from Dell directly. 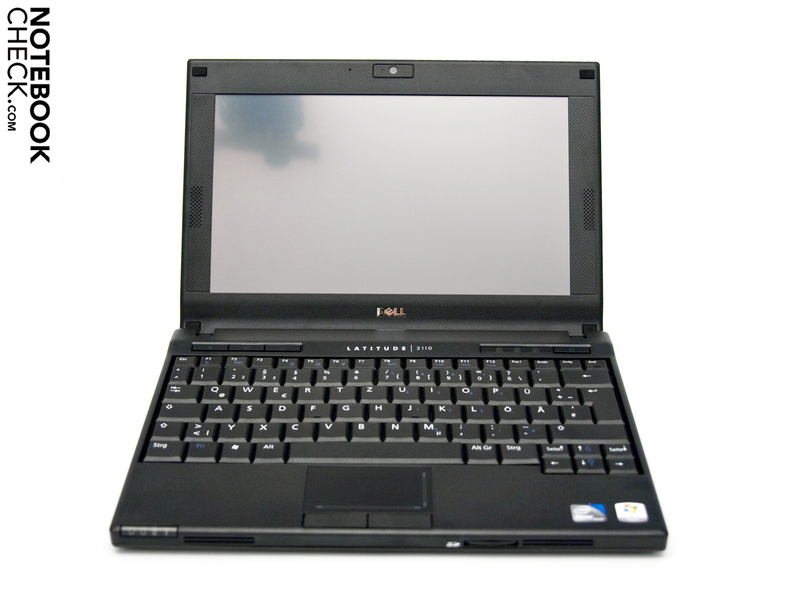 This base model comes with the Intel Atom N470 processor, 1 GB of DDR2-6400 memory, a 10.1-inch screen with a native resolution of 1024 x 600, 160 GB of hard drive space and Ubuntu Linux 9.10 Netbook Remix pre-installed. Our review model is a little more expensive at €479. For this we got, amongst other things, a 10.1-inch touchscreen with a matt finish, a 3G module and Windows 7 Starter as the OS. 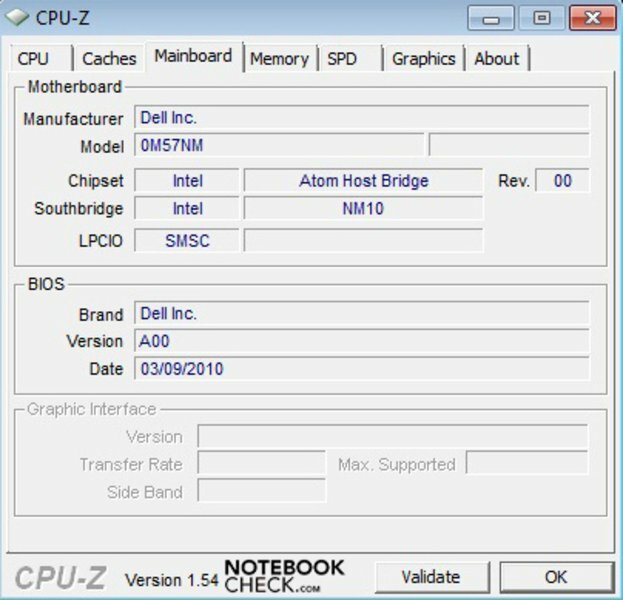 Dell offers an extensive array of optional features, but the yellow and green colour choices have been removed this time round. Now the customer can choose between black, blue and red (without affecting the price). Other options include an HD screen (1366 x 768, not a touchscreen), an SSD with 64GB of space, an upgrade to 2 GB of RAM, a 2 megapixel webcam and much more besides. The design is very plain and conservative. 3.99 cm at its heighest point? Too much! The rubberized surface is convincing. The Latitude 2110 is certainly not sleek and elegant, but it is robust. Dell has decided against a smart, slimline case since it should be able to withstand heavy use in a school, university or office. With dimensions of 26.5 x 18.7 x 2.25-3.99 cm (w x d x h), the case is rather chunky and the thick six-cell battery increases this effect. The battery raises the standing position by a whole 18 mm. The netbook is also relatively heavy at 1.58kg including the battery. The case's primary asset is its sturdiness. The external surfaces are covered in a rubberized pattern which makes them very resistant to scratches and other outside influences. The case is firm, only flexing very slightly when subjected to strong pressure. The lid is relatively thick at around 10 mm; it is sufficiently resistant to torque forces. Unfortunately the thick edging makes the 10.1-inch screen look much smaller than it is. The lid hinges are well constructed and hold it firmly in position. Shaking the netbook around a little does not cause the screen to move. The maximum viewing angle is good at around 150°. With the two Kensington lock slots you can attach a handy carry strap to the netbook, and you can also put a name plate on the battery. This is particularly useful in large offices or classrooms. 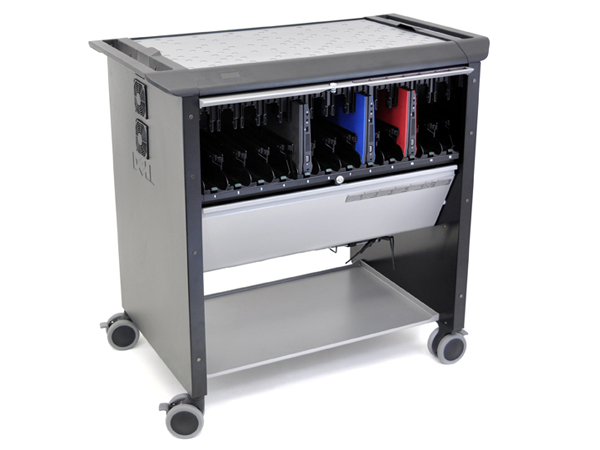 Another nice feature for school use is the rectangular light on the back of the lid, which allows a teacher to monitor network activity. Overall not much has changed in terms of design, with Dell sticking with the case of the Latitude 2100. 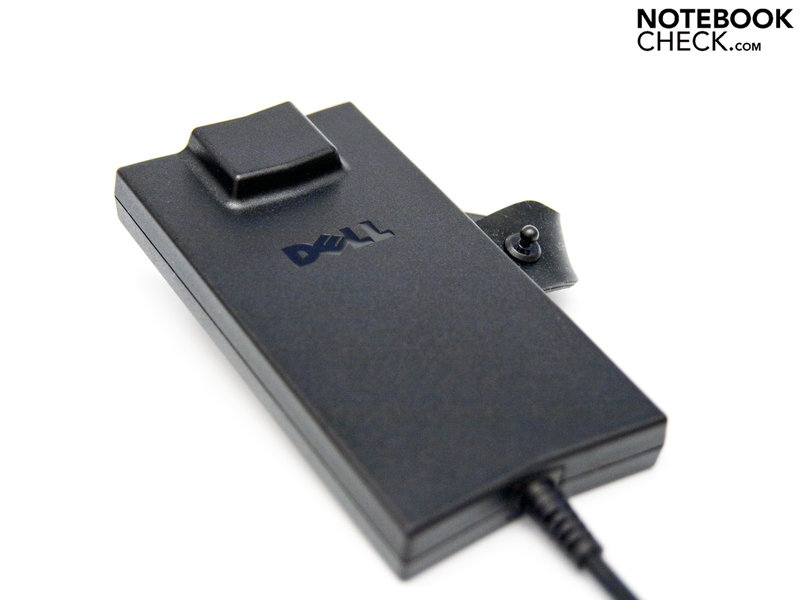 The netbook has a 3-in-1 card reader. You can work on the go thanks to 3G. 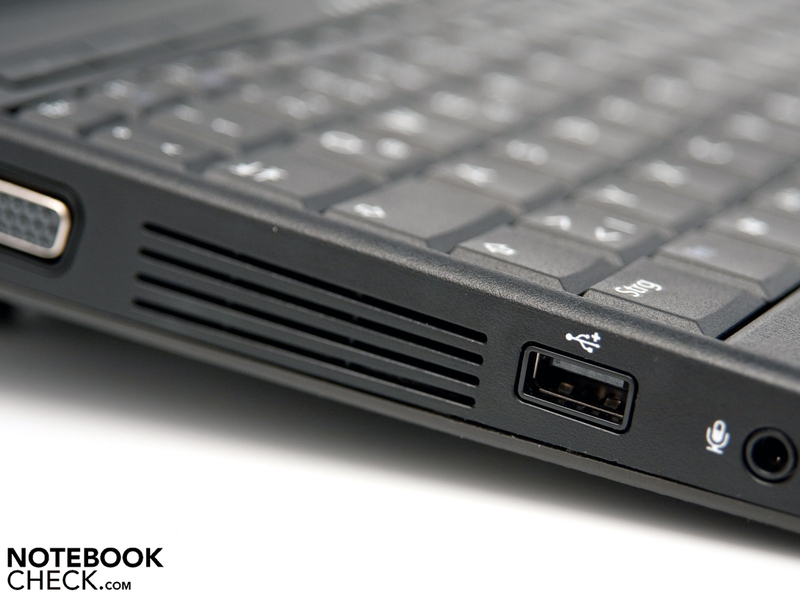 For a business netbook we would have liked to have seen a little more than just the standard range of ports. 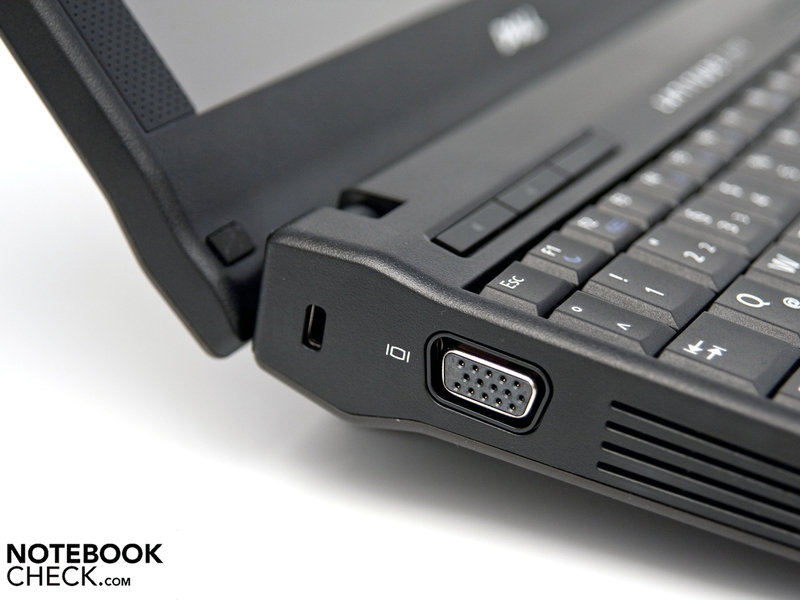 The Latitude 2110 only comes with three USB 2.0 ports, a VGA (an analogue video port for connecting to a projector, for example), audio ports for a headset, a 3-in-1 card reader supporting SD, SDHC and MMC file types, and an RJ-45 network connection. Faster peripheral ports, such as an eSATA or USB 3.0, would have rounded off the selection nicely but are not included. Dell has laid the ports out sensibly leaving sufficient room between them. Mobile technology plays an important role these days and Dell has satisfied all possible demands in this area. Gigabit ethernet and 802.11a/g/n WLAN go without saying, and the top model also comes with an integrated 3G UMTS module which can be used with your SIM card. The new micro-SIM cards (also called 3FF), found for instance in the Apple iPad, are not supported. 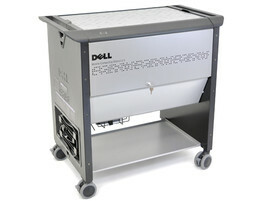 Dell offers an unusual accessory in the form of a Mobile Computing Station. 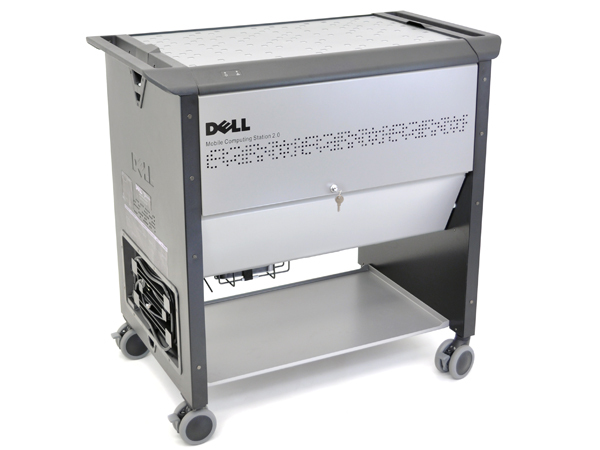 This is a sort of trolley in which you can store, recharge, secure and update up to 24 Dell Latitude 2110s. This would be a particularly interesting solution for IT departments in a business, since it allows you to perform software updates on all the netbooks at once via a WLAN access point which is integrated into the station. The system is mobile and can be freely wheeled around the office and connected to any available power supply. At the end of the work day you can lock up the trolley to protect all the machines from theft. But the system does not come cheap, being priced at a hefty €3,500. 'If it ain't broke, don't fix it' could be Dell's motto as far as the keyboard is concerned, as they have not made any changes. 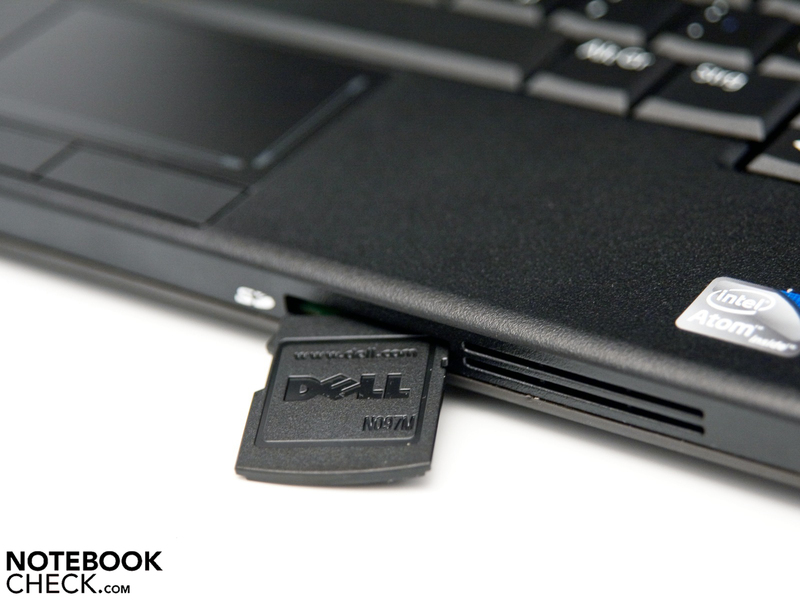 With a key size of 16 x 16 mm it is comfortable to work with, and the keys have enough travel. It does not take long to get used to the keyboard and its layout. One particularly good feature is the large right-hand shift key. The Fn keys are clearly marked. Even those who type a lot will have no problem with this keyboard. The touchpad has also been kept the same; measuring just 7mm diagonally it looks very small. It does have a vertical as well as horizontal scrolling region, but this takes up even more precious space. We would like to have seen a larger touchpad. The surface glides smoothly and has a good feel to it. It supports multi-touch gestures which are another positive feature and are easy to get the hang of. But if you really want to work efficiently we would suggest using an external USB or Bluetooth mouse. Calibration only takes about 20 seconds. The user is spoilt for choice when it comes to the screen. The base model is available with two non-touch screens, with native resolutions of 1024 x 600 or 1366 x 768 (HD). Our review model is fitted with a 10.1-inch touchscreen which also has a native resolution of 1024 x 600 (WSVGA). The AUO31D2 display has a diagonal length of 22cm and works at a maximum of 60 Hz. The screen's low resolution means you have to scroll down more often on internet pages or text documents. 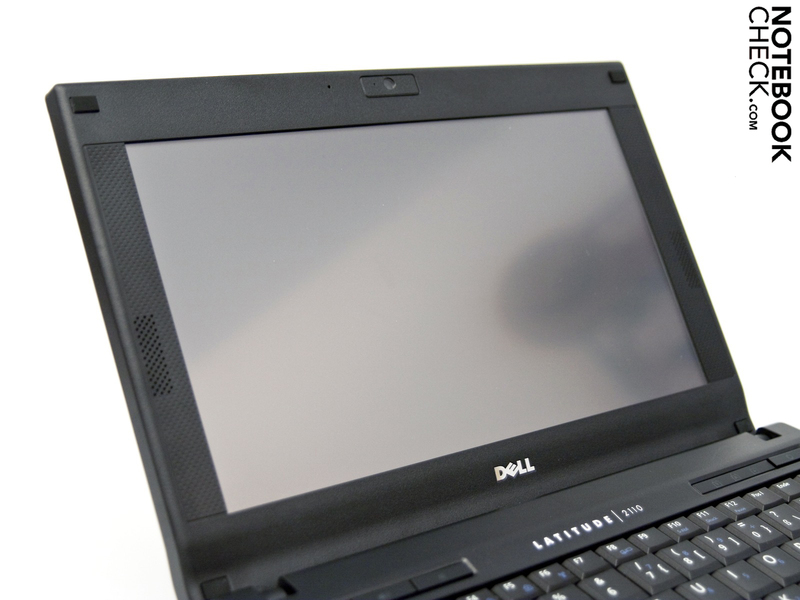 The surface has an anti-reflection coating, called 'antiglare' by Dell. 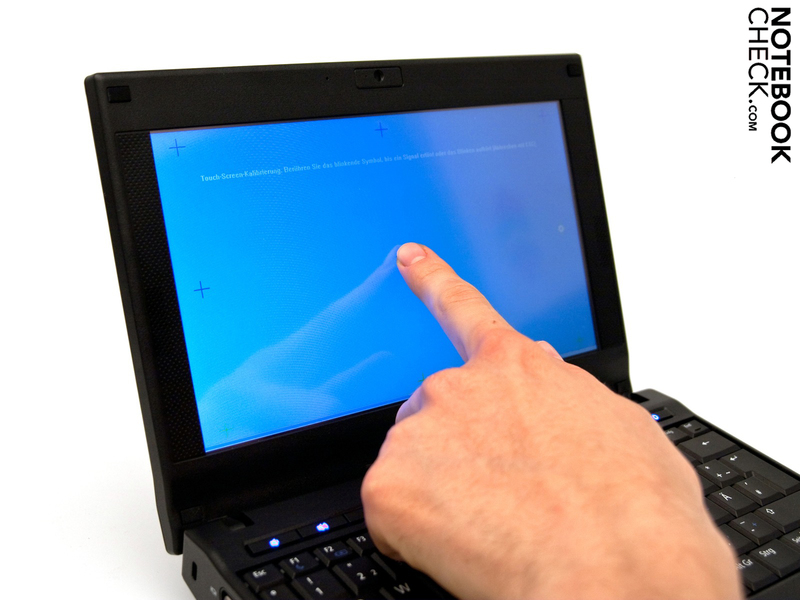 The touchscreen should first be calibrated using the IdeaCom software which is included. The process takes around 20 seconds and couldn't be simpler. After this initial set up the touchscreen works very well, allowing you to steer through Windows with your finger, with no problems for the vast majority of the time. If you look at the brightness levels we measured, you will quickly see that they are merely average. The average brightness was 188.3 cd/m²; the maximum was 198 cd/m², measured in the lower right-hand segment of the screen. The distribution of brightness is fine at 87%, but the black level of 1.23 cd/m² is unfortunately too high. This value is also responsible for the poor contrast ratio of only 153:1. But to the naked eye, the clarity and colour reproduction of the touchscreen is still acceptable. Though the screen is matt, it is still not entirely suitable for use outdoors. It may keep reflections to a minimum but the mediocre brightness means the screen is barely readable in strong outdoor light. However, when indoors, the matt screen is much more pleasant to work with than a glossy one. 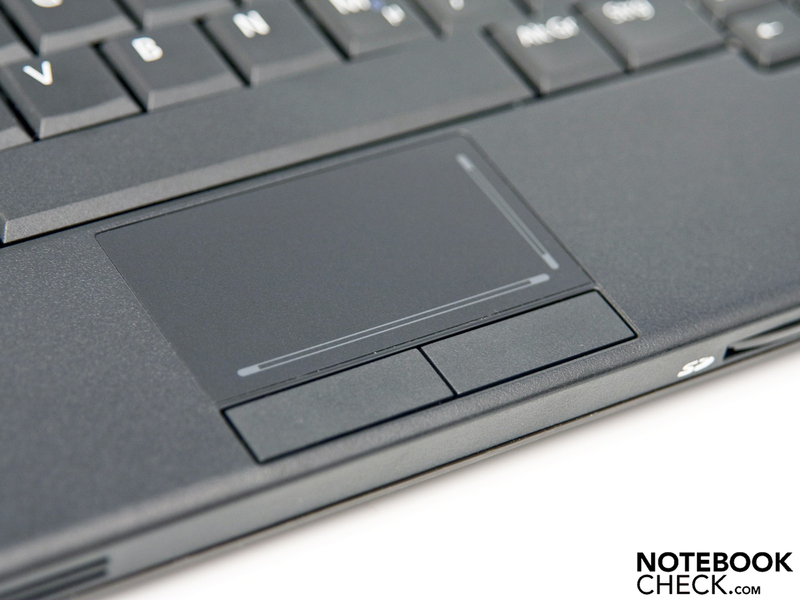 Viewing angles are not particularly stunning on the majority of netbooks; and the Dell Latitude conforms to expectations in this respect. The screen contents remain clear for a good range of horizontal angles up to 160°; but vertically even very small deviations of between 5 and 15 degrees cause major distortions to the picture. 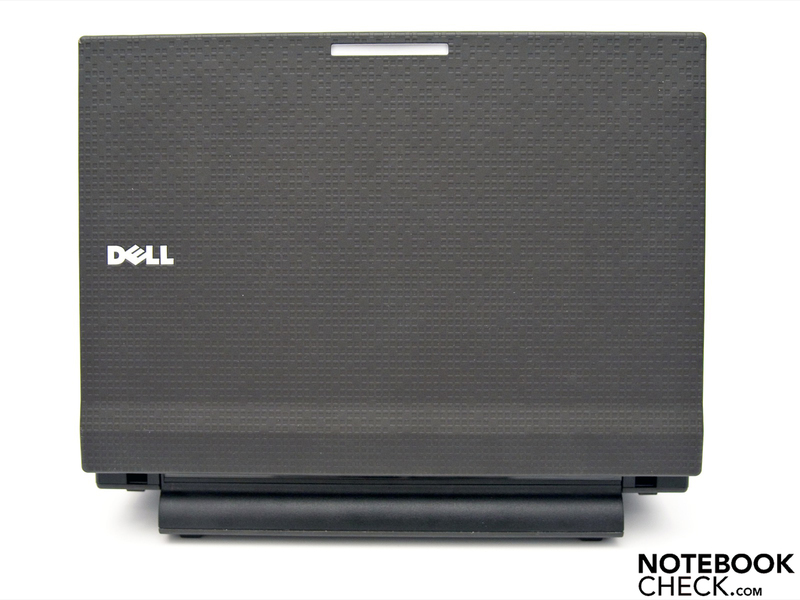 The Dell Latitude 2110 comes with new but not revolutionary netbook hardware. 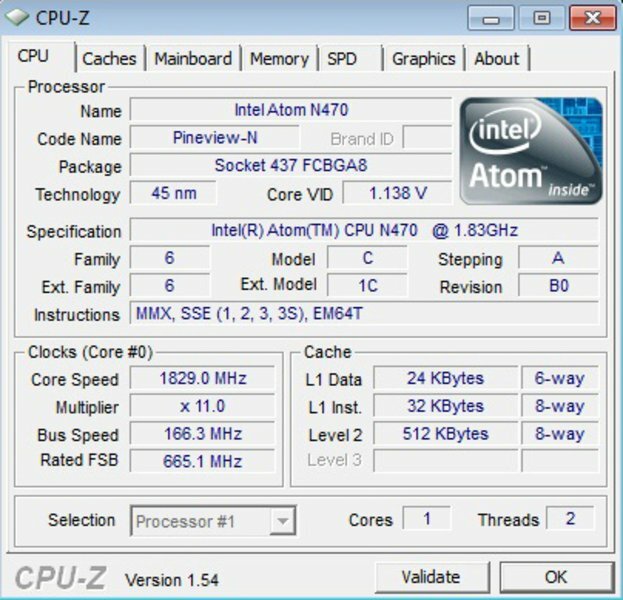 The processor is a marginally more powerful Intel Atom N470, around 200 MHz faster than the Atom N450. The processor's controller supports DDR2 memory, and so it comes equipped with 1GB of DDR2-6400 memory. 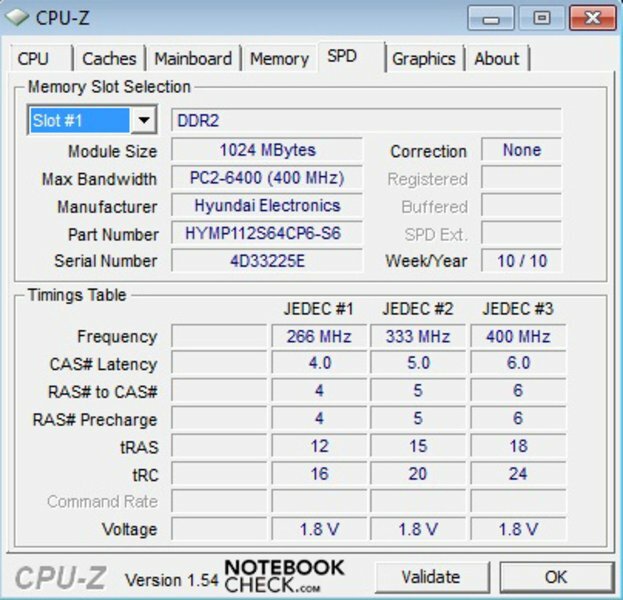 Without support for DDR3, this new business netbook will perform at roughly the same level as the large number of machines with an Intel Atom N450. 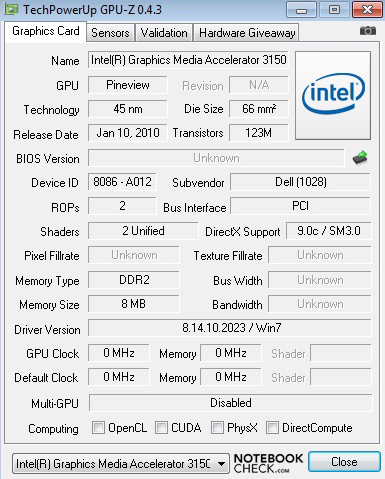 For graphics, the netbook is fitted with an Intel GMA 3150 graphics chip, which works with a core speed of 200 MHz. Our review model also includes an 160GB, 5,400 rpm Seagate hard drive. 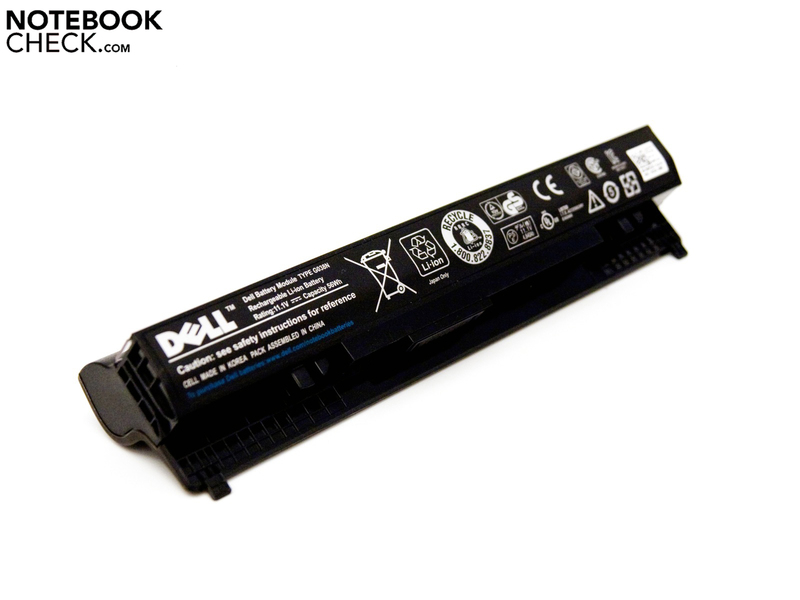 Dell offers other versions with more hard drive space or a 64GB solid state drive (SSD). But these, along with an upgrade to 2 GB of DDR2 RAM, incur an additional cost. 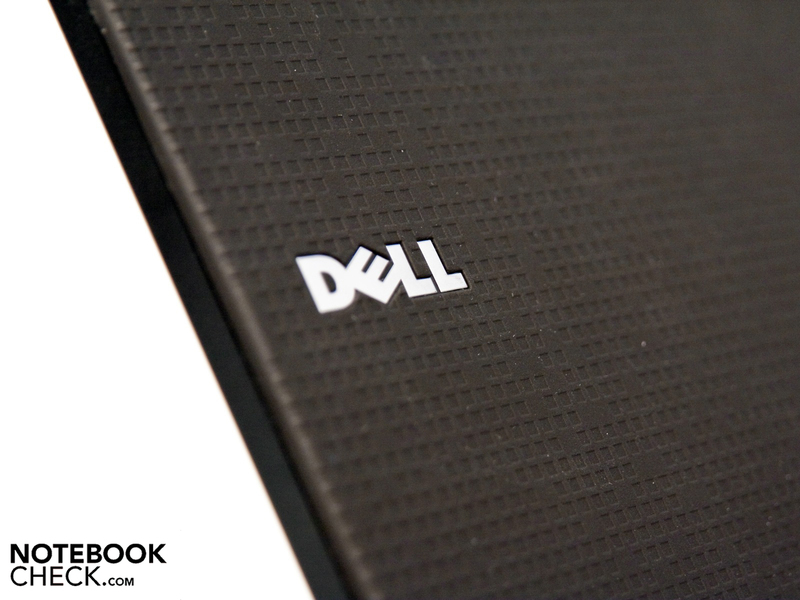 We put the Dell Latitude through various benchmarks to analyse its system performance. 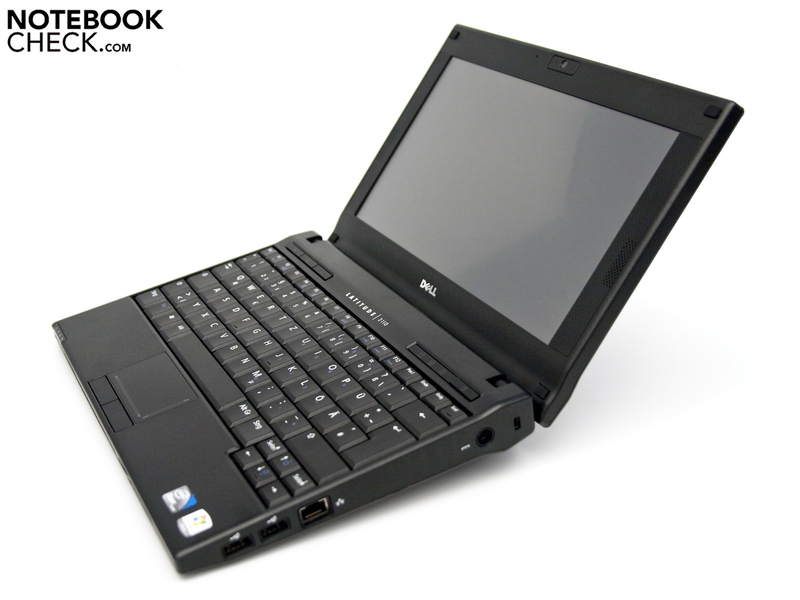 The high performance profile was selected throughout, and the netbook was connected to mains power. In this situation the CPU works at 1.86 GHz in one core. The application benchmarks (in the form of the CineBench R10 and Futuremark PCMark tests) show that simple office activities can be carried out without a problem. But the difference in scores between this netbook and netbooks with an Atom N450 is in single figures. You can see that the stronger processor and the faster memory have very little, if any, significant effect. The 3DMark series of synthetic gaming benchmarks will dash any hopes you might have had that modern games and FullHD video content can be played smoothly. If you need more graphics and HD performance than this, you should be looking at a netbook with Nvidia ION 2, or waiting for a machine with the Intel Atom N550 dual-core processor (not yet available). A 2.5-inch Seagate hard drive (ST9160314AS) is included as standard, offering a total capacity of 160 GB. 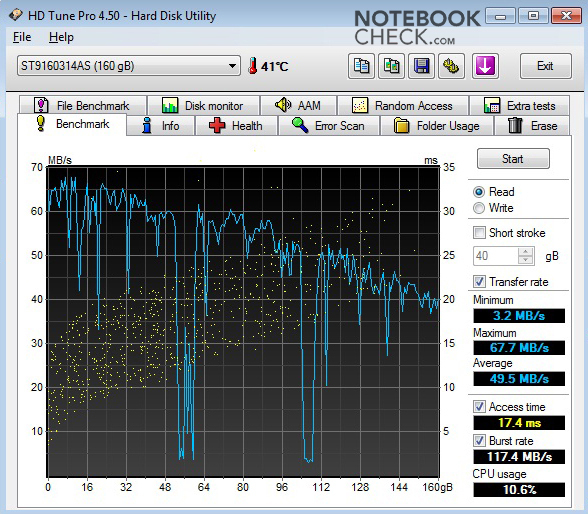 We used the HD Tune Pro 4.50 tool to assess its performance. The benchmark results for reading are not particularly high, but for normal use they are fine. An upgrade in performance could be achieved by opting for the solid state drive with 64 GB. 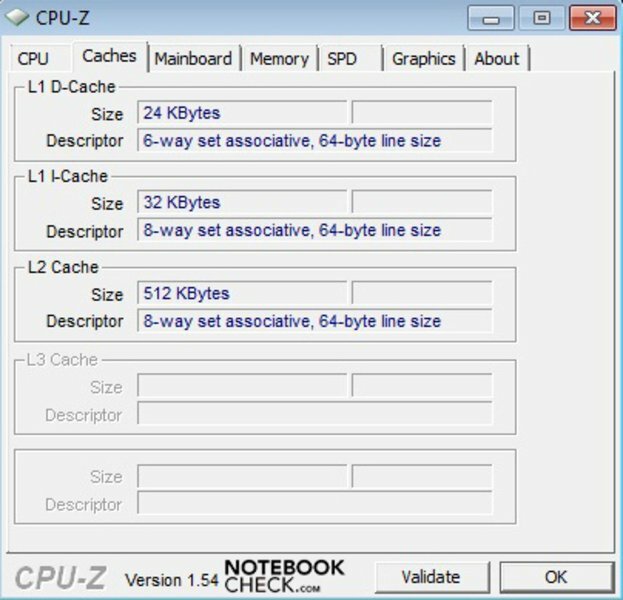 Now we come to the latencies running Windows 7 Starter. If these values exceed 1000 µs, it can lead to problems with synchronising peripheral devices. A very well-known problem is crackles of sound when using an external sound card. 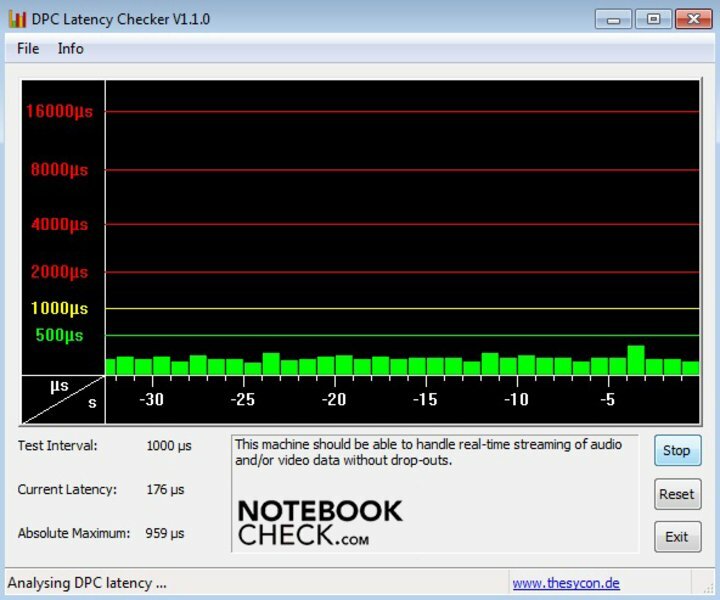 With the help of the DPC Latency Checker tool we examined the situation. Our review model had no problems, with the values remaining completely untroubling in the green region. With a maximum volume of 32.2 dB(A) when running flat out, the Latitude 2110 is always quiet, and only rarely becomes audible. When idle, the machine is almost completely silent with a minimum reading of 29.6 dB(A). The hard drive, when accessed, produces a constant 31.2 dB(A), which is reasonable for a 2.5-inch drive. All in all the sound produced by the cooling system is very much acceptable, and provides no grounds for complaint. When busy, the system produces heat which the fan attempts to expel through four small slits on the left side of the machine. This results in higher temperatures in the area around the vent. Under heavy use the area reached a maximum of 40.2°C. Such temperatures do not present a danger to the components; and working with the netbook on your lap should not be a problem. 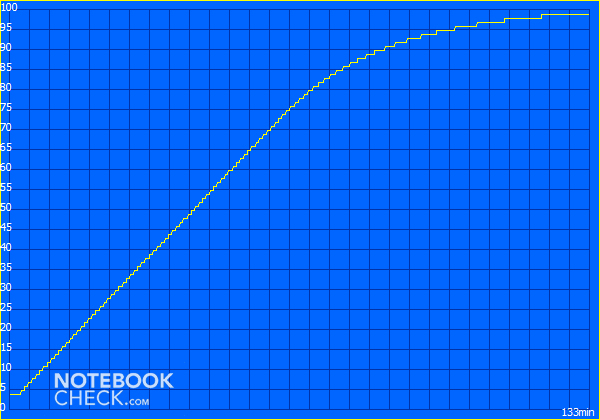 (+) The average temperature for the upper side under maximal load is 31.2 °C / 88 F, compared to the average of 29.8 °C / 86 F for the devices in the class Netbook. (+) The maximum temperature on the upper side is 33.6 °C / 92 F, compared to the average of 33 °C / 91 F, ranging from 21.6 to 53.2 °C for the class Netbook. (+) In idle usage, the average temperature for the upper side is 29.6 °C / 85 F, compared to the device average of 29.8 °C / 86 F.
(+) The palmrests and touchpad are reaching skin temperature as a maximum (32.5 °C / 90.5 F) and are therefore not hot. (-) The average temperature of the palmrest area of similar devices was 29.3 °C / 84.7 F (-3.2 °C / -5.8 F). The loudspeakers are positioned on either side of the screen, and do not deliver a balanced spectrum of sound. There is too much emphasis on the high frequencies whilst the bass is neglected. But the sound is more or less adequate given the intended target audience. For better sound quality you should use the audio jack to attach external speakers. 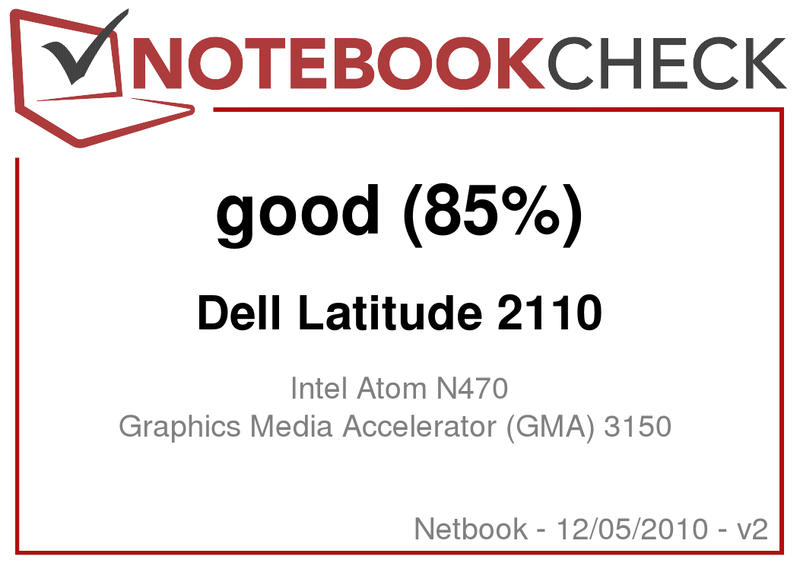 The Dell Latitude 2110's energy consumption is within reasonable bounds, but a little higher than netbooks with Intel Atom N450 processors. The thermal design power (TDP) of the Atom N470 is exactly 1 Watt more than the N450. 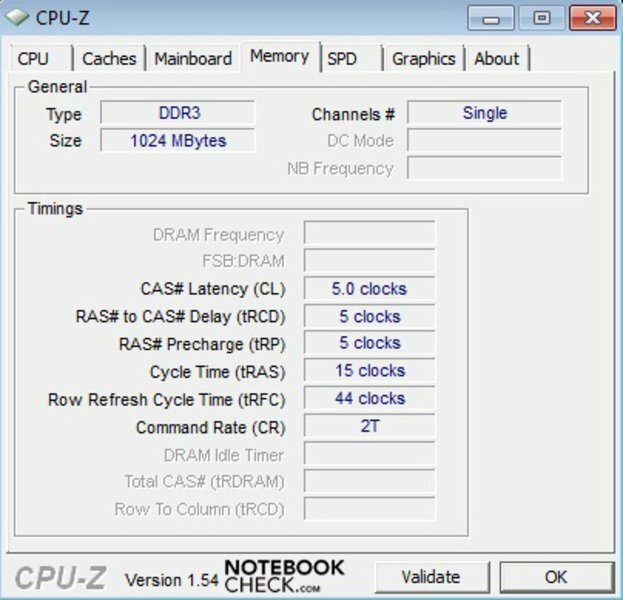 During normal usage the netbook consumes a maximum of 11.5 Watts. Under heavy use this can rise as high as 16.4 Watts. The slightly increased energy demands of the hardware has only a minimal effect on the battery life. Our review model has the optional six-cell (56 Wh) battery, which should provide longer battery life. 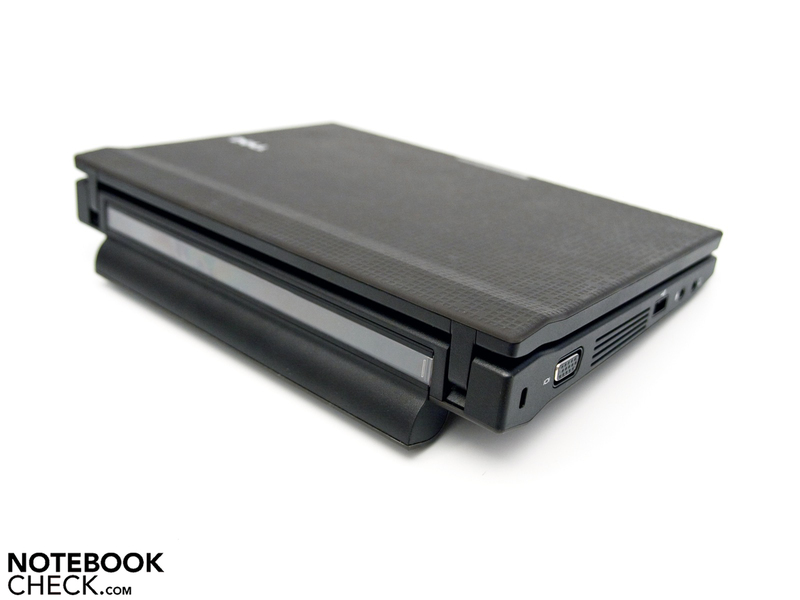 The disadvantage of this battery is its bulkiness, bringing the total height of the netbook to 18mm. The Battery Eater Reader's Test gives the maximum possible battery life, simulating the reading of a text document with the lowest screen brightness setting and wireless technologies switched off. In this situation it took a good 9 hours and 50 minutes before the battery ran out and the machine could no longer be switched on. 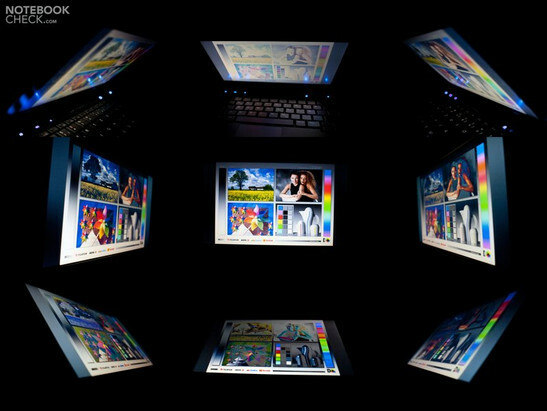 With medium screen brightness and WLAN enabled, up to 7 hours and 13 minutes of surfing the net and writing emails is possible. The Battery Eater Classic Test performs an OpenGL calculation with maximum screen brightness and all energy saving measures turned off. The battery also performed well in this test, lasting 4 hours and 37 minutes. Fully recharging the battery (3-100%) took 133 minutes, and then the machine is completely ready to use again. Overall the battery life is convincing, but slimmer models with Intel Atom N450 processors do offer up to four hours more battery life whilst offering almost identical performance. 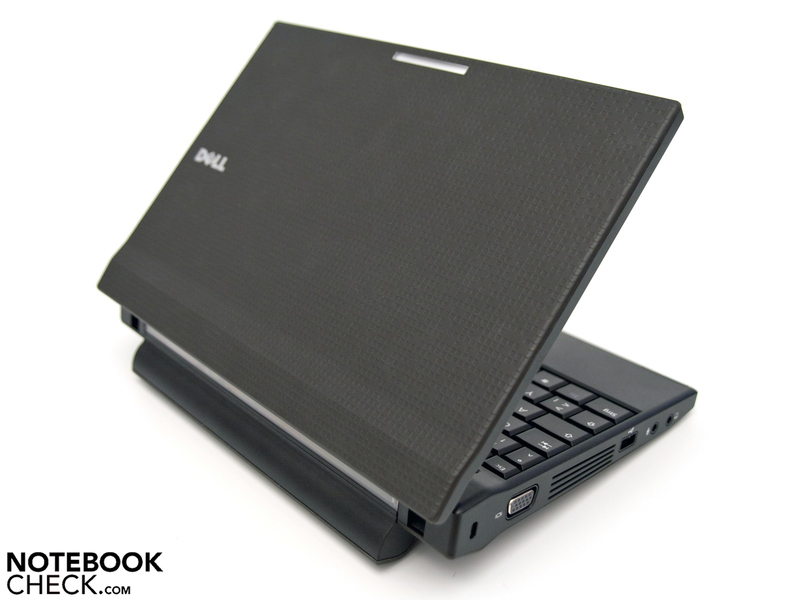 The Dell Latitude 2110 business netbook makes a largely positive impression, but with a few negative points. On the positive side, the case is very robust, the touchscreen works well, and the machine is very customizable. Unfortunately Dell has not changed anything about the case design, and so it is still very bulky, and not light either, weighing in at 1.58kg. Further downsides are the mediocre screen brightness, the fact that the N470 brings only a marginal improvement in performance, and the energy consumption which is nevertheless higher. One great feature is the comfortable keyboard, which will be appreciated by people who have to type a lot. 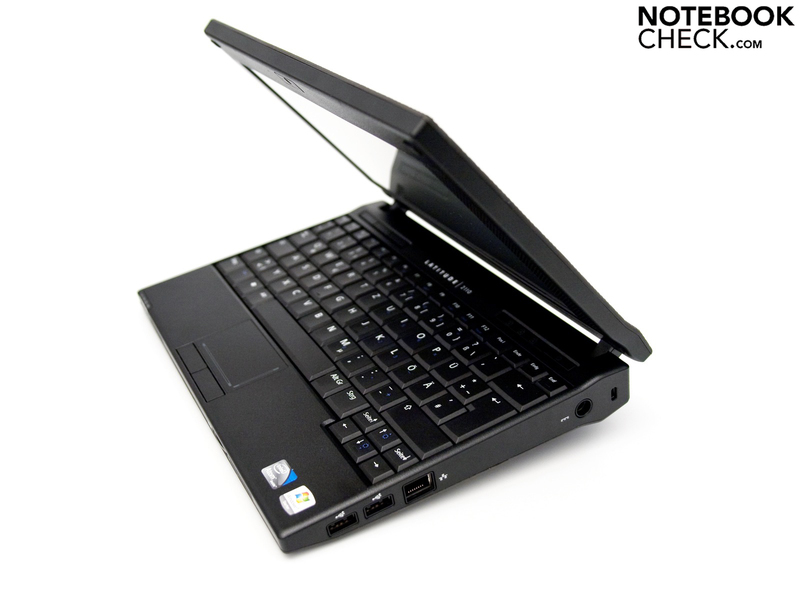 The Latitude 2110 is a very versatile netbook with many handy features that suit its target market. For home users the comprehensive support and additional options (like the mobile computing station) are somewhat irrelevant and also too expensive. 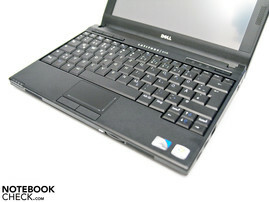 A consumer netbook would perhaps be more appropriate, such as the Dell Mini 10 or netbooks by other brands. These netbooks are generally lighter and less expensive for the same level of performance. 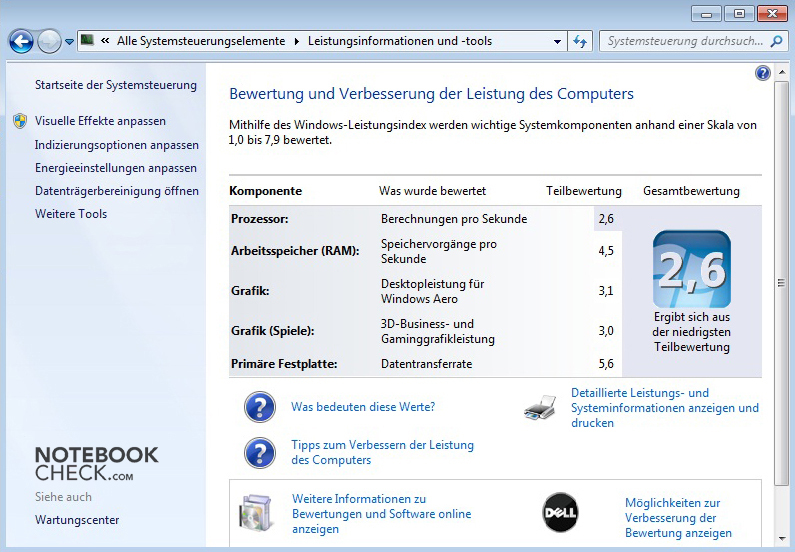 Dell Latitude 2110 Netbook: Business-Gerät mit interessanten Features. mains adaptor with cable, operating system (disk), driver and data CD, Symantec Norton Internet Security (trial version), Dell Backup und Recovery Manager, FastStone Capture, Dell Webcam Central, IdeaCom screen calibration, Microsoft Office 2007 (trial version), Windows Live Essentials, 12 Months Warranty, Colours available: Chalkboard Black, Schoolhouse Red, Blue Ribbon. 12 month warranty including Collect and Return. 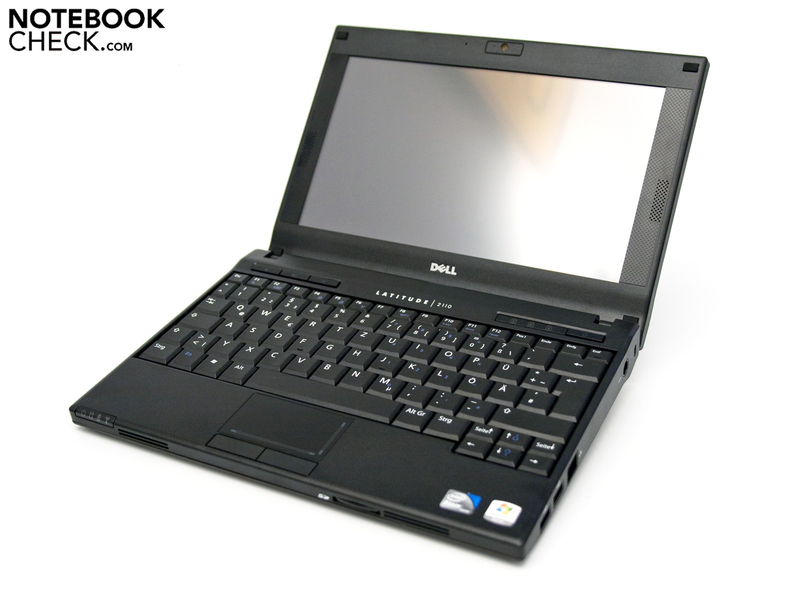 The Dell Latitude 2110 is a 10.1-inch netbook for businesses or educational establishments. 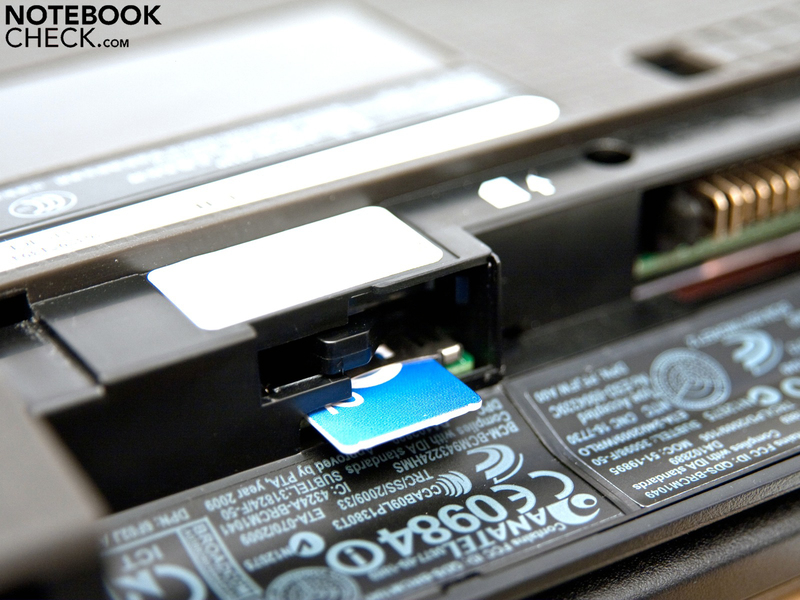 The six-cell, 56 Wh battery brings the netbook 18mm higher. On the underside there are no access panels, making it difficult to reach the hardware. The air vent is too small and air is not removed quickly enough. 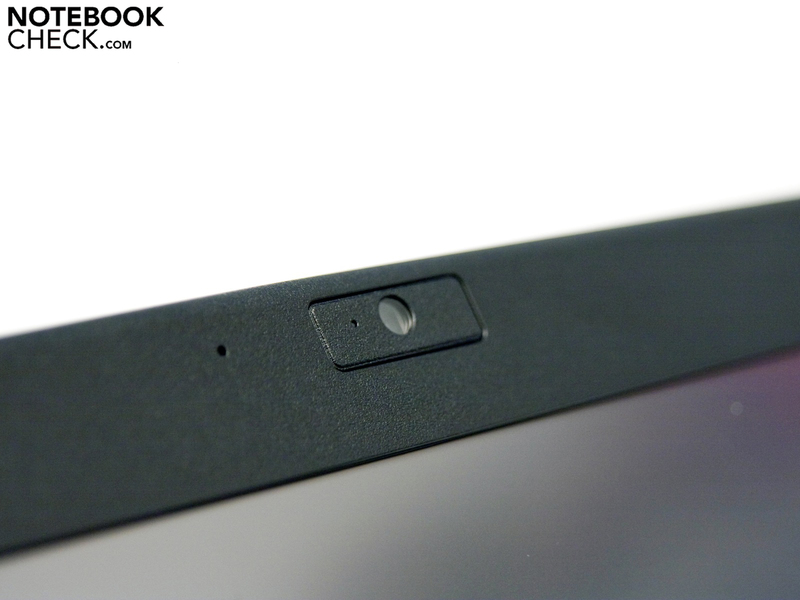 A built-in 2.0 megapixel webcam is available for an additional price. 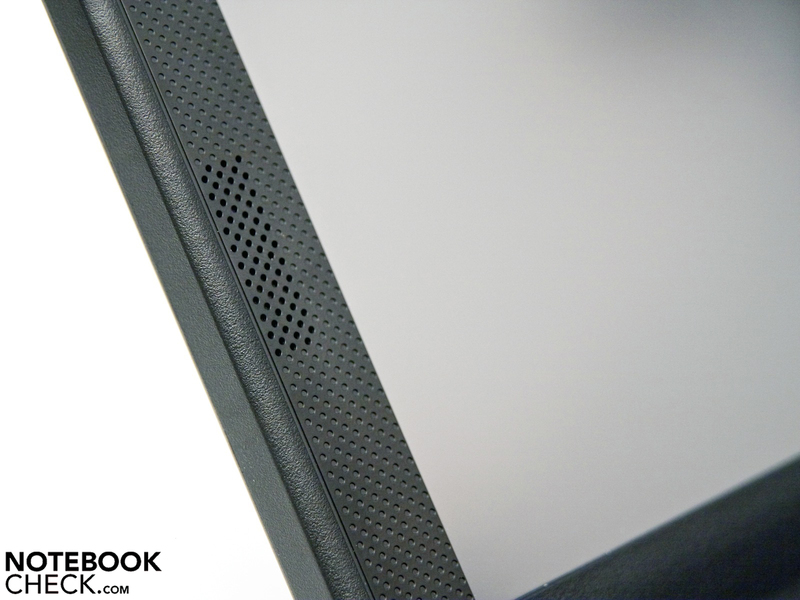 Most netbook speakers are bad, and these are no exception. but cannot be seen properly outdoors. The obligatory status LEDs have not been forgotten! For €473 (special offer) you get a business machine equipped with Windows 7 Starter and the latest Intel hardware. ... and also too heavy, at around 1.58kg. 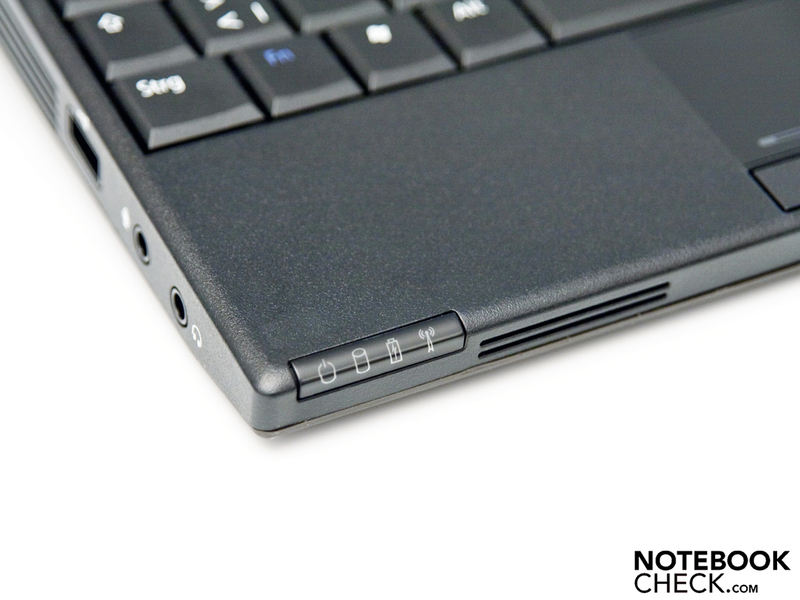 The rubberized surfaces protect the netbook perfectly. The design is far from spectacular; the case is chunky. Happily the mains adaptor is very slim and weighs 280g. 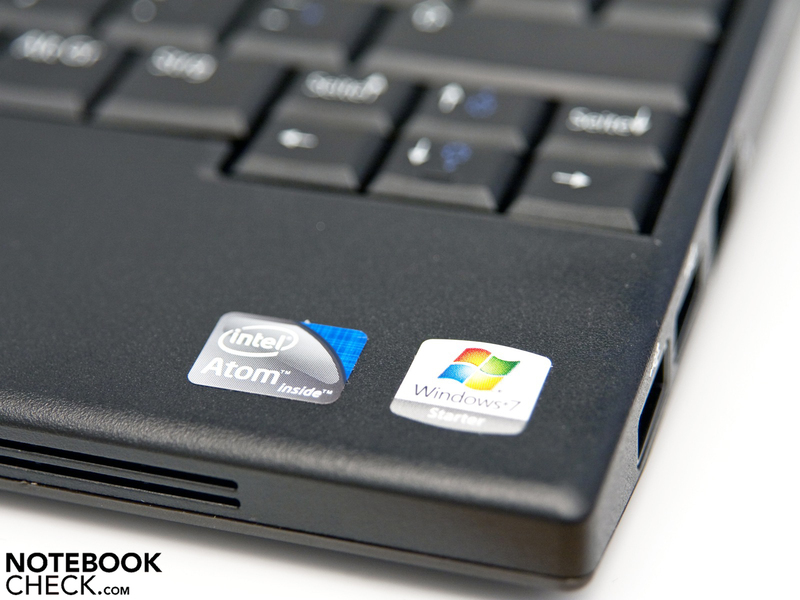 How customizable the netbook is; and its updated hardware, rubberized surfaces, touchscreen and integrated 3G module. More ports for peripherals, and a slimmer case design and lower weight. The comprehensive support, the options available when you buy from Dell directly and the touchscreen which worked very well. 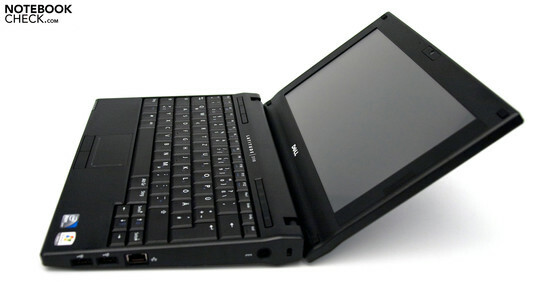 Netbooks with touchscreens and modern Intel Atom processors, for example the ASUS Eee PC T91, the larger ASUS Eee PC T101MT and the Samsung NB30-Pro Palm Touch netbook.